The world famous De Wolfe Music Library are re-issuing some of the rarest and most sought after soundtracks from their 100 year history. Among them is Paul Ferris’ soundtrack to the 1968 classic Witchfinder General which starred Gothic-horror legend Vincent Price in the title role. The film was directed by Michael Reeves (The Sorcerers, Castle of The Living Dead, She Beast), who died suddenly in 1969 aged just 25. 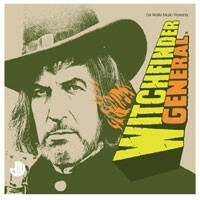 Witchfinder General was his last film. Telling the story of the sadistic and brutal Matthew Hopkins (the eponymous Witchfinder General), this was a controversial film upon its initial release, with many of the more graphic scenes of violence being cut. The director’s tragic death added to the film’s notoriety and helped forge the cult status it has today. © Steve Wilson and The Third Realm, 2018. Unauthorized use and/or duplication of this material without express and written permission from this blog’s author and/or owner is strictly prohibited. Excerpts and links may be used, provided that full and clear credit is given to Steve Wilson and The Third Realm with appropriate and specific direction to the original content.